We love that so many of you have enjoyed this project!! We teamed back up with our friends at Canon USA to add a tutorial video to help you create your own version of these! 🙂 If you still prefer the images and text, keep scrolling to see the original tutorial below. 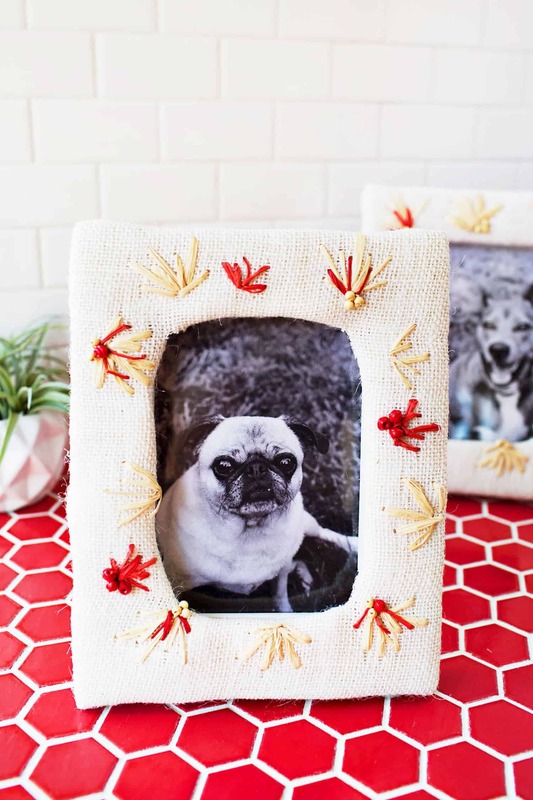 As you might imagine, there are lots of projects here at the blog that are just plain fun. There are also lots of other people’s projects that I like helping with, like when Emma needs “help” and wants us to eat her latest culinary creations and give her feedback. That is my favorite kind of helping. Especially when I forget to bring my lunch. Aaaaaaanyway, I had seen a few tutorials of people attempting to print their own nail decals, and I thought it looked like a really fun project to try as part of our Canon USA collaboration. Although I loved the girls that printed little cat faces to put on their nails (so cute! 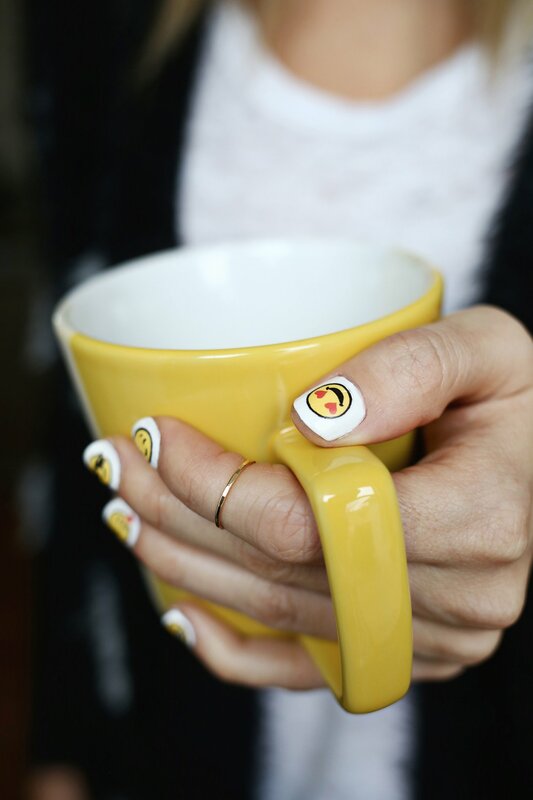 ), I thought emoji nails would also be a fun statement. There were a couple of ways that people went about making their decals, but this way worked best for me, and I even made you your own emoji design sheet download with 3 sizes to choose from! Start by painting your nails with a few coats of white nail polish. Then, follow the instructions on your Rub-Onz film paper and print your emojis onto the matte side of your frosted film paper. Of course you need the color to really pop on these, so using our PIXMA TS8120 was a big help here. Any time you’re using these specialty papers, you have to watch for loss in color, and of course our printer didn’t disappoint. 🙂 Be sure to adjust your print settings for the best quality. The downloadable images are already flipped backwards so they will look correct once applied, but if you make your own design, be sure to reverse the image before you print them. 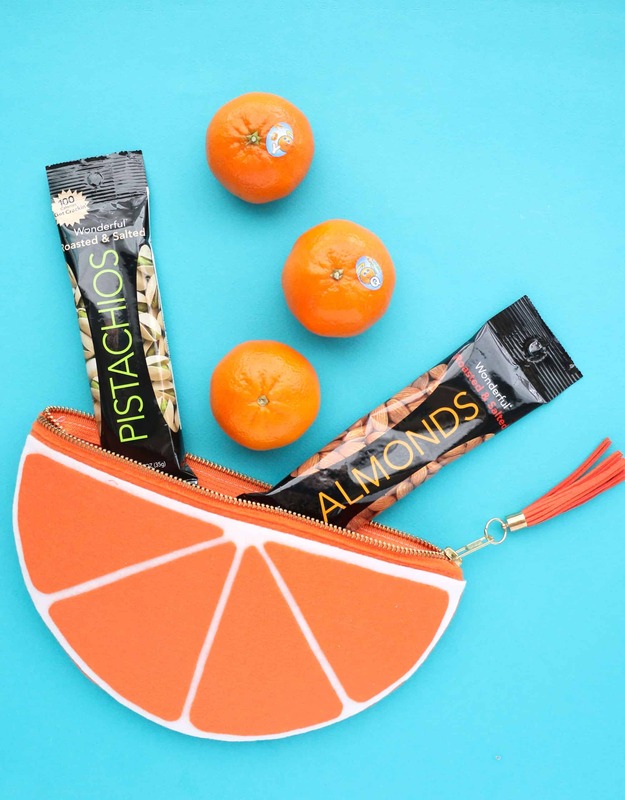 The Rub-Onz kit comes with two kinds of paper: one type of frosted film paper that you print your design onto and one type of paper that has an adhesive film with a white liner to transfer your design. 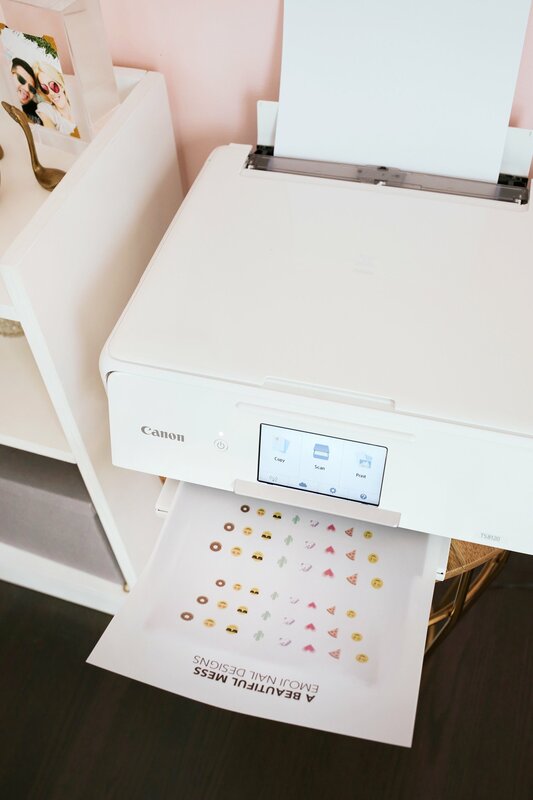 Once your designs are printed onto your frosted paper, cut a piece of the white backed adhesive paper that is big enough to cover your emojis. 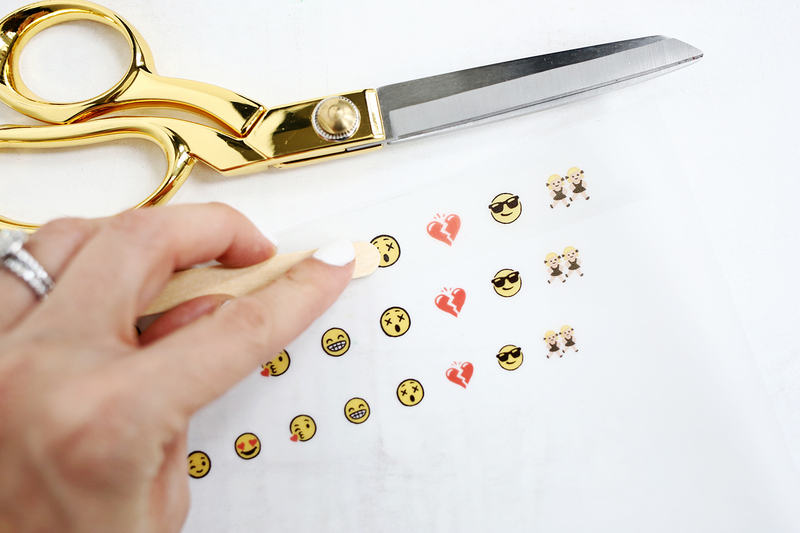 Gently peel back the white backing from the adhesive film and place the clear adhesive film on top of your emojis. Make sure as you peel the two layers apart that the sticky adhesive layer is sticking to the clear film and not the white backing that you discard. Use a popsicle stick or a coin to rub the clear adhesive and printed layers together and remove any air bubbles between them. 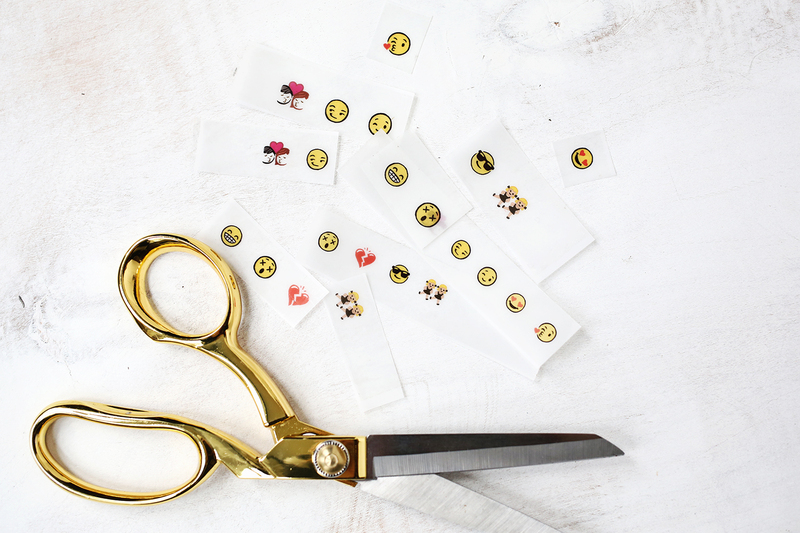 Use scissors to cut around your emojis, getting as close to the printed edge as you can (the designs seemed to transfer better when I cut as close to the edge as I could). 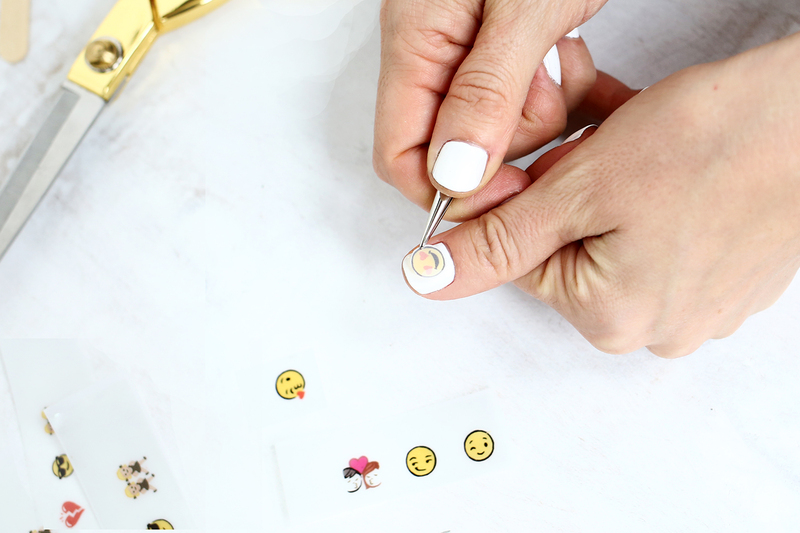 Peel off the clear liner layer on top of the design to reveal the adhesive lining, flip the design over, and place the design onto your nail. I found it helpful to use tweezers for this part since the decal is rather small. Press the design onto your nail and use the popsicle stick or coin to rub the design in place. There is still a protective layer on top of the design, so keep rubbing until the corners on the protective layer begin to lift and separate from the decal. Once you see the corners lift, pull the protective layer off and finish the nail with a layer of clear topcoat to seal the decal on the nail. Repeat the process until you have all the desired nails covered. To remove, just use regular nail polish or acetone remover and it should come right off. 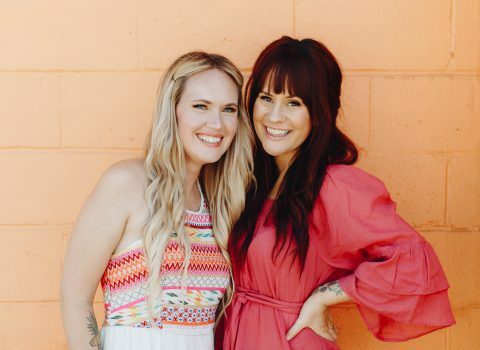 Credits // Author: Laura Gummerman, Photography: Laura Gummerman and Elsie Larson. Photos edited with A Color Story Desktop. Super cute! Random question-are you guys ever going to bring back the emoji stamps in the ABM shop? 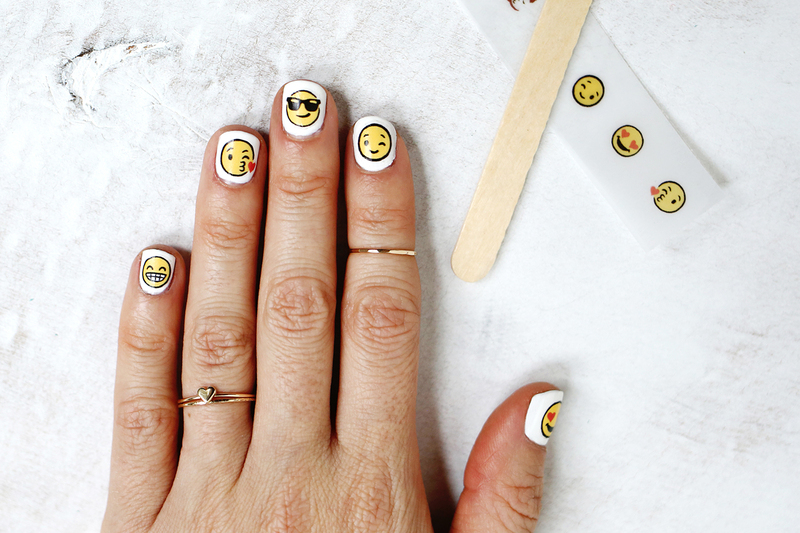 This is such a fab idea, and the emojis look awesome! This is so cute! What a great idea! LOVE that film paper! “OBSESSED” does not even do my feelings about this justice. I love to do my nalis at home, and this idea is soo cute 🙂 I need to try out stamping decals too! Oh, the designs are so cute and the idea so great. Love your posts guys! These are amazing! 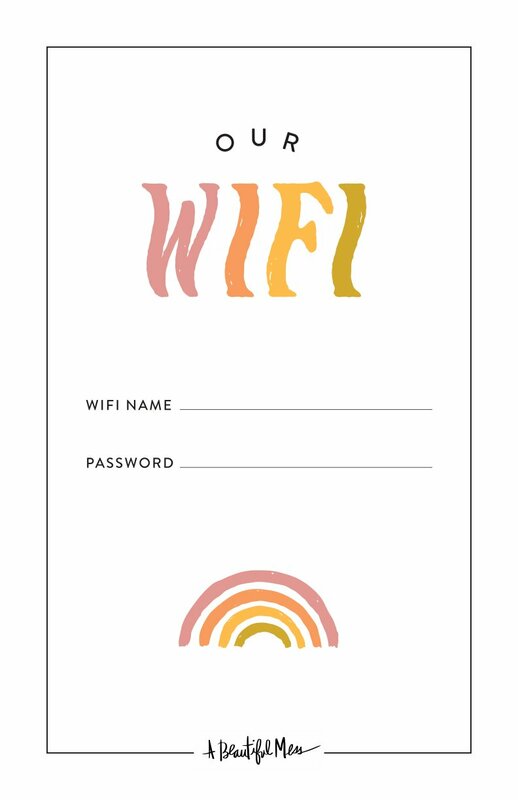 We need to figure out how to use our printer properly so that we can make these. Not sure if you can help with this but how do we print 2×2 photos on this printer? We bought it to do your Instagram photobooks but haven’t been able to figure it out:/ Any help you can give will be much appreciated! I never would have thought of something like this. These are so funny. Talk about making a statement, or expression, or face? What will she come up with next? Very creative. How awesome is this!!!! There are so many emojiis that I wish existed, I might even be tempted to paint on my own creations. Love it! This is just the cutest thing!!! Love it ?? Wow amazing! You are just awesomely doing and result is superb.Keep it up!! Love the playful nail art. 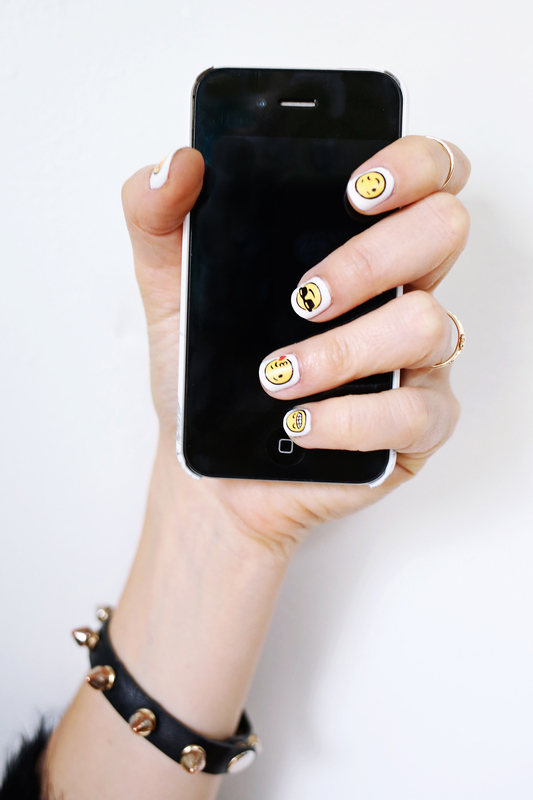 Yes to emoji nails! I think I prefer these to the emoji t-shirts going around because these are a bit more subtle, but still a lot of fun! Such a cute idea! I never would have thought of that! Where’d you get those scissors? Love those! These are so cute, I love emoji’s they are so fun! I sometimes wonder how to decorate my nails. I liked the one with emoji. Also, I recommend to use additional products for nail growth and strengthening. Here’s the best nail growth system I’ve ever tried https://duri.com/product-category/nail-growth. Good luck, girls!